Can anyone make a mod that scales the governmental planet caps with the number of planets available? I've tried, but its beyond my abilities. I have basically quit playing over this issue. The game just becomes unbalanced in the larger galaxies. I'm basically one of those weirdos that loves large scale micro managing. The biggest galaxies that my computer can handle with everything as abundant as possible. The commonwealths are an interesting idea, but get to be a pain after a while. I know that there might be a mod that does this along with a bunch of other changes, but I don't want the other changes, just the governments. It would make that game playable again. Not possible, in thier wisdom Stardock thought it was a good idea to lock ColonyLimit into GovernmentDefs.xml. It is not part of the Stat Table like everything else. The best you can do is adjust the caps to each size map you intend to play in that session, tedious but required. I included zip files in my "Looks like Glacatic Star Trek" modpack, that increase the colony limits by: 25%, 50%, 75% or 100%, they should still work with the current patches. I have a mod (tool) that scales the Colony limit according to map size. Let me see if it still works for Retribution. If anyone is interested I will bundle some instructions and post a link. 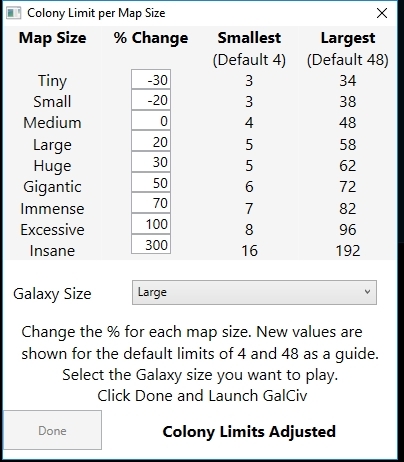 You now have to select which Galaxy size you want to play before launching GalCiv. It used to detect and modify on the fly, but alas, not any more.